As you drive into Sandalford Estate, you are greeted by a majestic entrance and welcomed by lush greens and vineyards. Sandalford Estate is located along West Swan Road in the popular Swan Valley region. It is one of Western Australia’s oldest and largest privately owned wineries and was founded back in 1840. When you enter the restaurant, it feels like you’re stepping back in time. The restaurant features a rustic interior and a dining area outside, shaded by 125 year old vines with beautiful views of the vineyards and its surrounds. Perfect for blue skies and cool, sunny days. 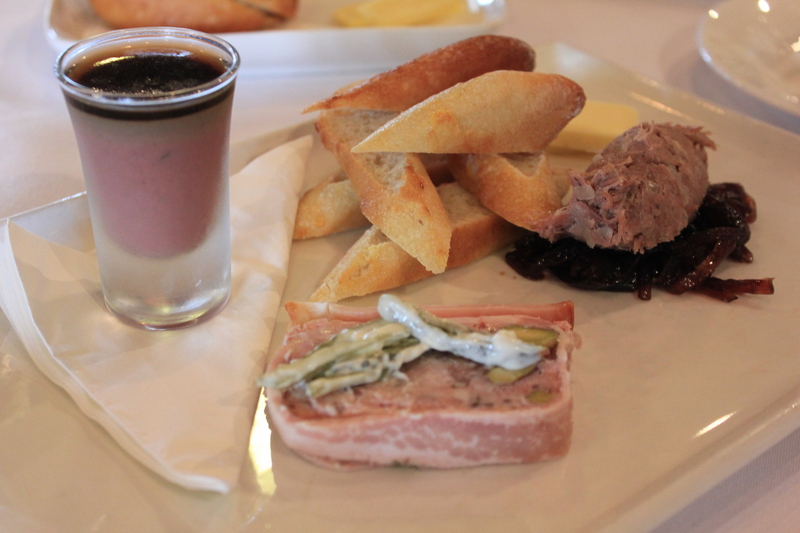 We started off with a Charcuterie Plate ($28) which consists of Duck Rilletes and Onion Jam, Pork Terrine and Cornichons, Chicken Liver Pate and Sandalera Jelly and Fresh Baked Baguette. It was well presented and executed. The Chicken Liver Pate was smooth and creamy. The Duck Rilletes were soft and flavoursome together with the sweetness of the Onion Jam. Oh and the Pork Terrine was lovely. 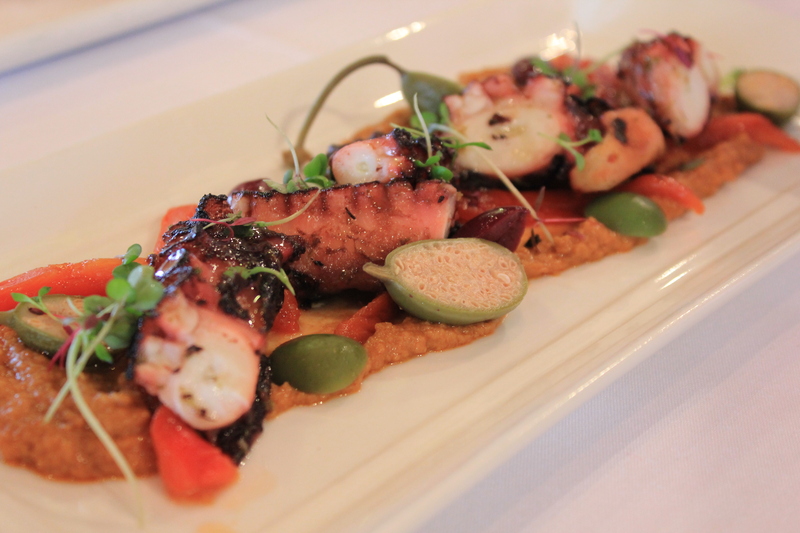 We shared a Chargrilled Fremantle Octopus with Smoked Paprika Hummus, Olive, Red Pepper and Caperberries ($22). The octopus was fresh – chargrilled perfectly from the outside while retaining is tenderness. Absolutely perfect. The smoked paprika hummus, olive, red pepper and caperberries marries well with the octopus, giving the dish a burst of flavour. I had the Seared Margaret River Venison Loin ($45) with Artichoke Puree, Braised Venison Shoulder Pithivier and Roast Baby Vegetables. The Venison Loin was executed well. See that red in the middle? It’s melt in your mouth juicy. It was perfect – not overcooked or raw. The Pithivier pastry was fluffy and the braised venison shoulder inside the Pithivier was tender. YUM! 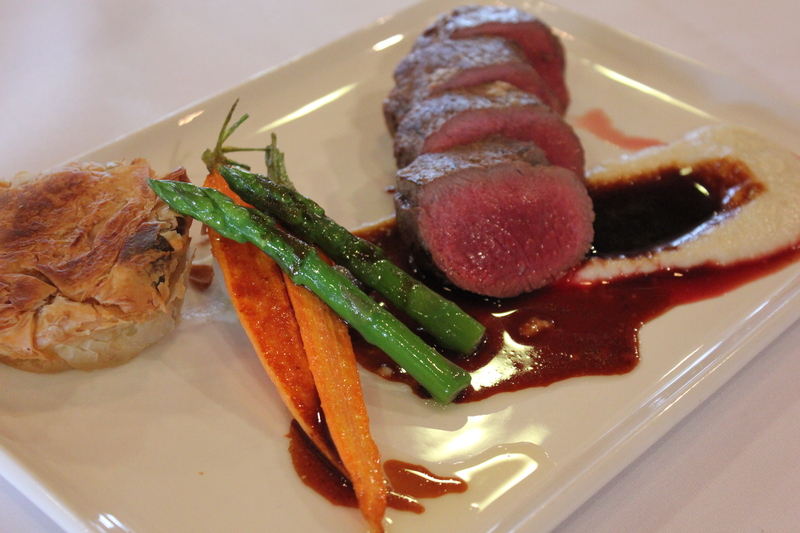 Seared Margaret River Venison Loin with Artichoke Puree, Braised Venison Shoulder Pithivier and Roast Baby Vegetables. From looking around, the royal blue chips seems to be making an appearance on quite a few tables. 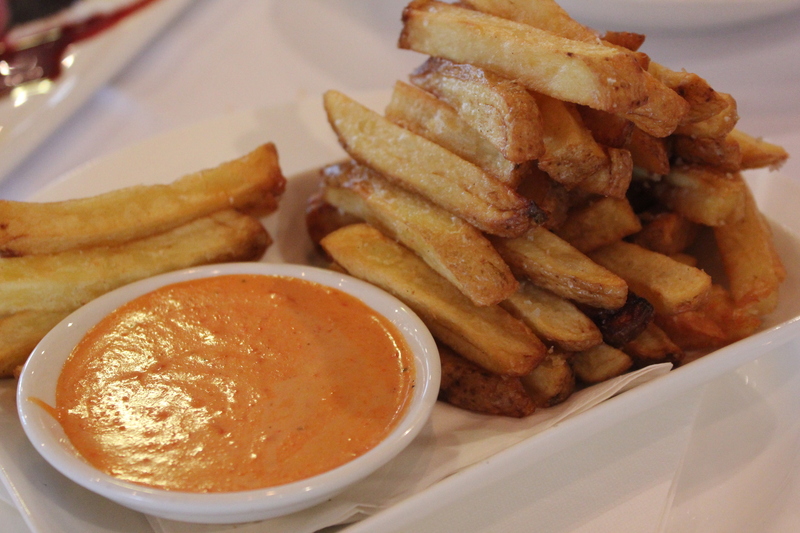 To complement our mains, we had the Royal Blue Chips with Cumin Salt and Roast Capsicum Aioli ($9.50). The Royal Blue Chips were delicious. With a sprinkled of cumin salt on top, it was like an icing on the cake. Oh and not forgetting the Roast Capsicum Aioli, giving it an additional punch and flavour to the chips. Yes, I could totally eat and snack on this all day. 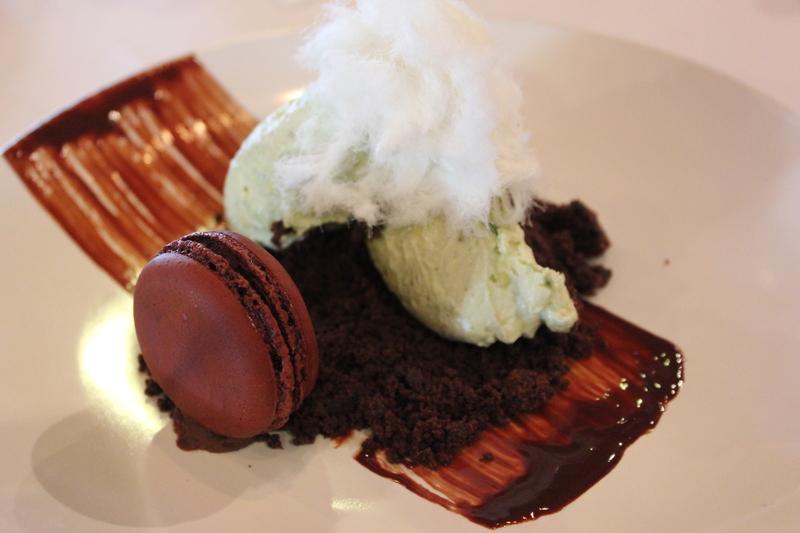 To finish off, we shared an Avocado Cheesecake with Chocolate Crumbs, Chocolate Macaron and Pasmak ($16). The Avocado Cheesecake was smooth, creamy and was not overpowering with strong avocado flavours. Light, subtle and delicate. How does chocolate and avocado work together? Surprisingly, the flavours actually complements each other well. It was meant to be. Overall, we had a lovely lunch together with a nice ambience. Food and presentation was topnotch. The service – attentive and excellent. 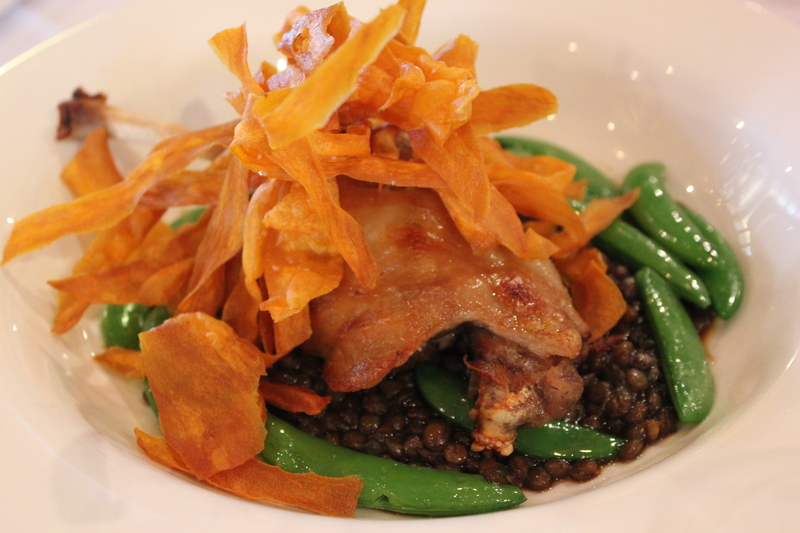 For dining at the restaurant, we also received a discount which we could use on the same day at the cellar door. I highly recommend Sandalford Estate Restaurant and I can’t wait to come back to Sandalford again to see what else they have to offer. You can also use your 2014/2015 Entertainment Gold Card here too! Where have I been these past few months? Follow me for more foodie adventures!